The attack on and sinking of the"13 de Marzo" tugboat in the early morning hours of July 13, 1994 is probably one of the worse crimes committed by the Cuban government under the rule of the Castro brothers and it is definitely the best documented and widely recognized by international human rights bodies and is referenced in books on international law. "Three and a half years ago, in the summer of 1994, something terrible happened out there, seven or eight miles out at sea, off the northern coast of Cuba. it was an incident that went all but unnoticed in the US media. The Cuban-American community protested but they protest a lot and as I say, we in the mainstream media all but ignored it. The Vatican, however, did not. Today this crime is absent from the public conversation on Cuba. It is important that it not be forgotten by the general public, remaining a painful memory among Cubans, and that the demands of justice for the victims and their families not be ignored. Three Cuban families seeking a better life away from the dictatorship sought passage aboard the Cuban tugboat the “13 de Marzo.” The captain of the tug was part of the group wanting to leave. The tugboat left Havana on Wednesday, July 13, 1994 according to reported accounts at around 3:00am. No sooner had they left the port they were being pursued by two other tugboats, also of the Maritime Services Enterprise of the Ministry of Transportation. "Polargo 2," one of the boats belonging to the Cuban state enterprise, blocked the old tug "13 de Marzo" in the front, while the other, "Polargo 5," attacked from behind, splitting the stern. The two other government boats positioned themselves on either side and sprayed everyone on deck with pressurized water, using their hoses. "We saw in the distance a boat with a Greek flag that appeared to be what stopped them. lt looked like the boat was watching what they were doing, the murder they were committing. So they stopped and decided to pick us up." 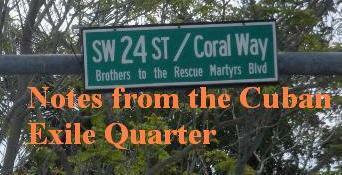 It was then and only then that the attack was suspended and the survivors picked up by the Cuban Coast Guard. "The workers' behavior was exemplary, there's no denying it, because they tried to stop them from stealing the boat. What are we to say to them now, let them steal the boats, their livelihood? The actions of the Coast Guard crews were irreproachable, they saved 25 lives. So, this is what happened and as soon as information became available, more details were given. Within three years of the crime beginning first with the United Nations Human Rights Commission in 1995, followed by the Inter-American Commission on Human Rights in 1996 and Amnesty International in 1997 all released reports on what had occurred with the information then available. The most in-depth of the reports was the one prepared by the Inter-American Commission on Human Rights (IACHR). 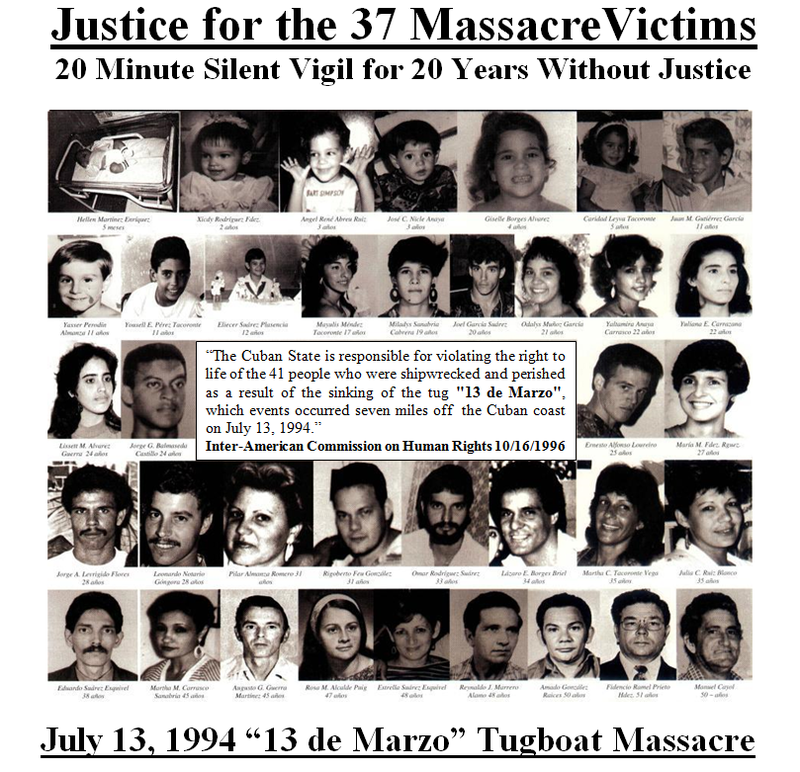 On October 16, 1996, the commission approved a public report concluding that on July 13, 1994, Cuba violated the right to life of forty-one people who died when Cuban government boats rammed, flooded, and sank the 13 de Marzo, a hijacked tugboat loaded with civilians fleeing Cuba. The report also found that Cuba violated the right of personal integrity of the thirty-one survivors of the sinking, and violated the rights to transit and justice of all of the seventy-two persons who attempted to leave Cuba. The report provides shocking survivors' testimony of the Cuban government's deliberate attempts to sink the boat. Statements by President Castro and the Interior Ministry regarding responsibility for the incident provide a disturbing counterpoint to the victims' experiences. Clearly, the government's effort was to exculpate itself from responsibility, rather than conduct a serious investigation and punish those responsible for this incident. In 2009 Jorge García who lost 14 family members on July 13, 1994 sat down and spoke on camera about what he had learned about the actions of the Cuban government both before and after the massacre. He also named names of those who participated in the attack and sinking of the “13 de Marzo” tugboat. On 6:00 p.m. on July 12, 1994, at the Port of Havana, Cuban state security knew that the “13 de Marzo” tugboat was going to be taken and had nine hours to prepare their response. What took place on July 13, 1994 was planned for ahead of time. "They tried on several occasions to kill my daughter, because she was the first to speak out and contradict the regime’s official narrative. Jorge and his daughter are now exiled in Miami. Jorge maintains an archive of information and has interviewed the survivors of the massacre and the families of the victims. He has also confirmed that the number killed that day was 37. The initial investigation had placed the number at 41 with four unknown but has now been confirmed to be the 37 listed below. Twenty years later and the thirty seven victims of a massacre are still without justice. Their families not only denied justice but have yet to have their dear departed returned to them for a proper burial. People of good will inside and outside of Cuba are organizing actions such as flotillas, candlelight vigils, 20 minutes of silence for 20 years of injustice, and Masses prior to and on July 13 to remember and continue the call for justice. The question I wish to ask you who are reading this: What are you willing to do? Please say a prayer for them and their families that the truth in its fullness is known and that justice be provided.